The DNA that makes up the human genome can be subdivided into information bytes called genes. Each gene encodes a unique protein that performs a specialized function in the cell. The human genome contains about 21,000 genes. Cells use the two-step process of transcription and translation to read each gene and produce the string of amino acids that makes up a protein. The basic rules for translating a gene into a protein are laid out in the Universal Genetic Code. 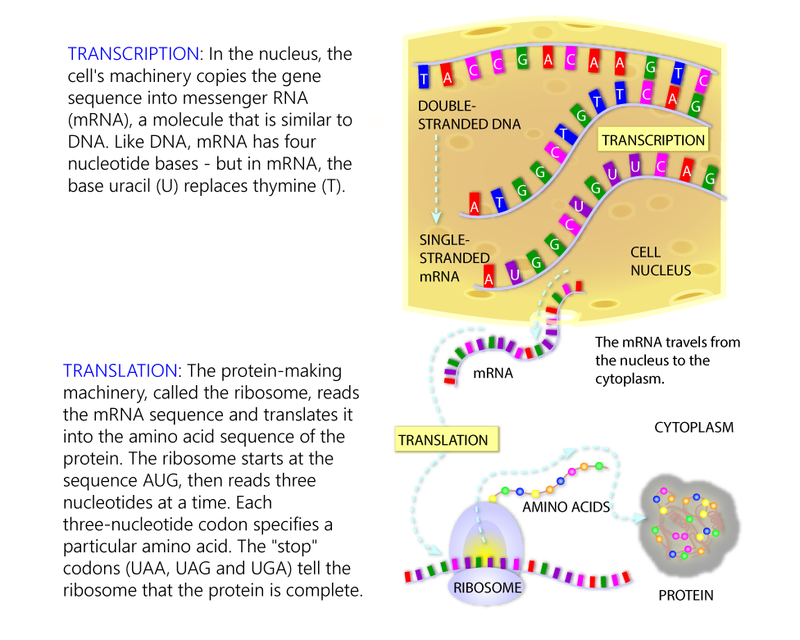 For an overview of transcription and translation, look over the diagram on the right. Then try it out yourself in the activity above! Genetic Science Learning Center. "Transcribe and Translate a Gene." Learn.Genetics. March 1, 2016. Accessed April 18, 2019. https://learn.genetics.utah.edu/content/basics/transcribe/.